Tester: Hispanic, (Puerto Rican) late 20's with some undereye circles and line lines. "I was lucky enough to have been given Olay's Eye Restoration Complex to sample several months ago after it's launch event, and this little beauty is now one of the only eye cream products left in my bathroom. With many eye creams, in addition to them not fully living up to their promise, they tend to be either too heavy, greasy or "ball up". On top of that, some eye creams don't deliver the moisturization that I need either. The Olay Professional team who created this product have addressed all of the above and I could not be happier. This lightweight white cream applied easily with it's tube applicator and dried down extremely quickly. What I was left with was the perfect amount of moisture, and my undereye area looking brighter and more toned with daily use. It never felt greasy, the cream never balled up under my concealer/makeup and it had a soft, silky texture which I loved. After several weeks using this eye cream and seeing the fantastic results, I simply got rid of many of the other creams I had been using -- this was just far superior. As we have mentioned on this blog, this Pro- X line of products is at the higher end price wise for drugstore skincare, but in all of our opinions, it is absolutely worth every penny!" T.V. 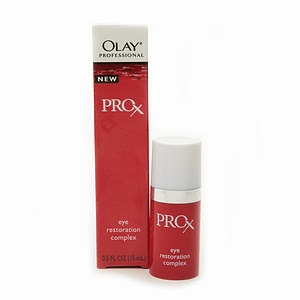 In the sea of eye skin care products that seem to cost a small fortune, it's so cool that Olay can continue to do great things for the everyday woman who can't afford the "Rodeo Drive" spa prices.